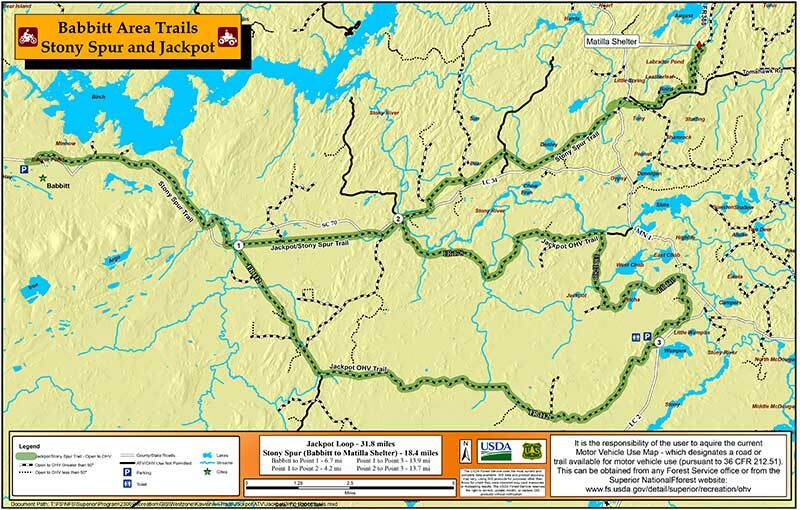 Make a day trip by planning a ride on the remote Stony Spur Trail that begins in Babbitt and now the NEW Jackpot Loop connects the wonderful Babbitt ATV Trail System for a total of 60 miles of fun riding. See map of Stony Spur and Jackpot Loop at right (click to enlarge). For another day trip, ATV enthusiasts will be able to ride to the Trestle Inn-Finland MN. The trails at the Trestle Inn will take you as far as Two Harbors and the North Shore. Those roads/trails will have signage to get you to those destinations. When staying at the Hotel, having the Stony Spur Trail 200 feet away from the Hotel is a great amenity to our guests. Ask us about our discounted room blocks. We can also provide a meal package to be hosted in our Event Center. Keep your eye on our Specials and put your name on our email list to be notified of special packages. After a long day of riding, kick your feet up at The Junction Bar and Grill. Relax on the deck, play a friendly competitive game of Horseshoes or warm up by the Fire Pit with your favorite beverage. Parking is abundant in the Hotel parking lot with room for Trailers, ATV’s, Trucks and Cars. 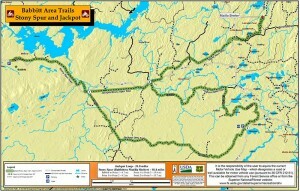 For more detailed trail mapping, check out www.dnr.state.mn.us or www. riderx.com to map out your interactive ride. Ely Chamber of Commerce also has information on trail conditions, etc.